Quoted as one of the finest examples of a Somerset long house, this grade 2 listed building is said to be of medieval origin. 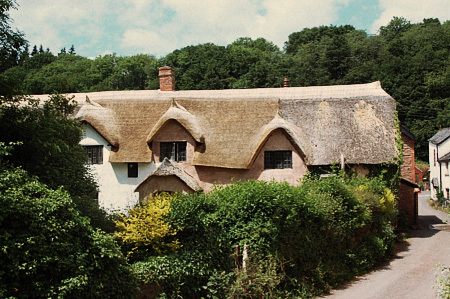 The building is predominantly of cob construction, with Elm half crucks and a thatched roof. Initial tasks consisted of carefully removing cement covered external walls and re-render using a 3 coat, haired, lime plaster. In addition to this, external rubble stone was raked out and re-pointed. On removal of the cement render, our team discovered damp and extensive blown and damaged cob in need of repair. A missing pargited embellishment and date stamp was exposed which demanded reinstatement to establish the historic credibility of this significant building. On completion of these external works Jones and Fraser have been commissioned to carry out vital cruck repairs, replace damaged lintels and to restore the internal plasters.